What would make my language loving high school daughter the happiest? If you guessed studying Latin, then you would be correct. 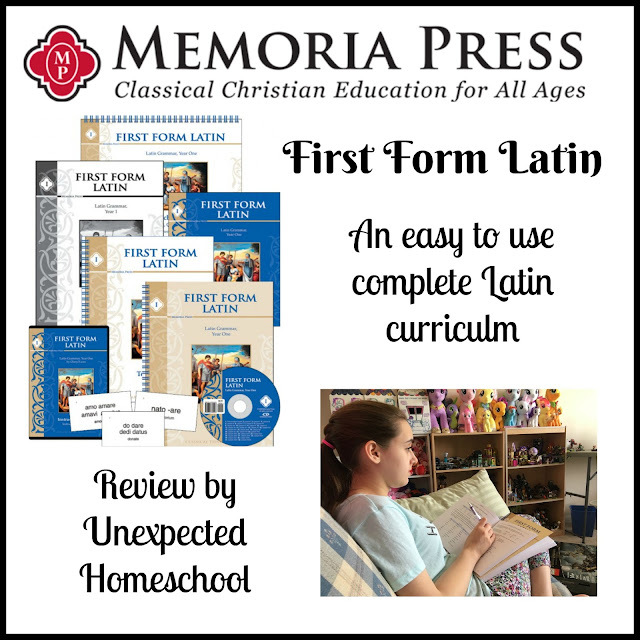 We've been using First Form Latin Complete Set from Memoria Press to refresh the Latin that Amber studied when she was younger. With the First Form Latin Complete Set we received everything needed for a student to study Latin for the first time or to move on to the next level of Latin learning. The Student Text - 34 two-page lessons along with appendices. Teacher Manual - All the instructions you need to assist your student in learning Latin, with inset copies of the Student Text pages. Student Workbook - Exercises associated with every lesson that reinforces grammar and vocabulary. Quizzes & Tests - A quiz to end each lesson and unit tests. Teacher Key - With the answers to the Student Workbook pages, lesson quizzes, and unit tests. DVDs - A three DVD set where the lesson material is covered by an experienced Latin instructor with on-screen information. Pronunciation CD - For daily listening to help the student with correct pronunciation, and vocabulary & grammar practice. Flashcards - Vocabulary, saying, and grammar cards for each lesson. First Form Latin is recommended for students 5th grade and up, or as a follow-up to Latina Christiana at any grade. My student used a different Latin program for three years in late elementary and early middle school, and now has just finished her first year of high school. 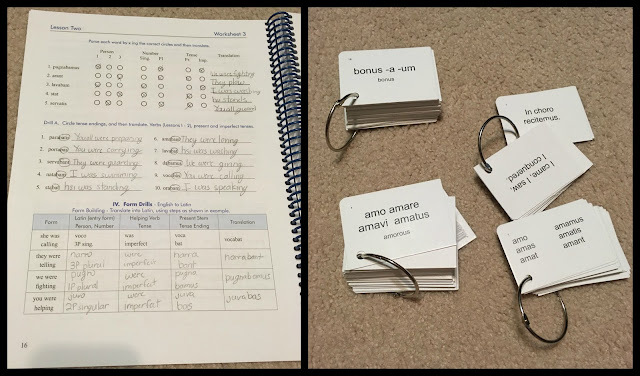 However, since she has not studied Latin for several years, we decided to begin again with First Form Latin to ensure she covered all the needed topics. Given this experience, I would say that First Form Latin might be a bit difficult for the younger portion of the given age range as a beginning Latin curriculum. Still, very motivated late elementary students could be successful. 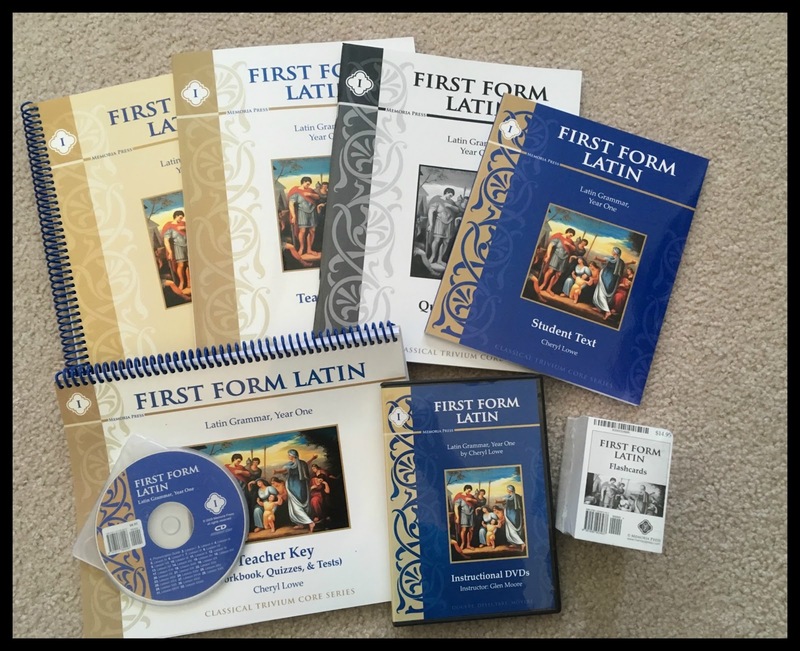 First Form Latin provides all the tools an instructor needs to help their student study Latin, even if the instructor has no Latin knowledge. The Teacher Manual provides guidelines for teaching Latin at the beginning of the book. Then every lesson has Chalk Talk notes to assist the teacher in explaining the grammar aspects. Additional FYI sections give details on the language and fun tidbits of trivia. Although Amber went through three years of Latin already, it was a mostly independent curriculum where I learned very little Latin. I very much appreciate the structure of this Memoria Press curriculum, which allows me to provide my student with the direction and assistance she needs even though I have never studied Latin. We were prepared for the DVD to be a no-frills recitation of the lessons in the Student Text. Instead, we were very pleasantly surprised by the presentation of the video lessons. Former Highlands Latin School teacher Glen Moore has a way of infusing humor into the lessons that does not feel cheezy or distracting. 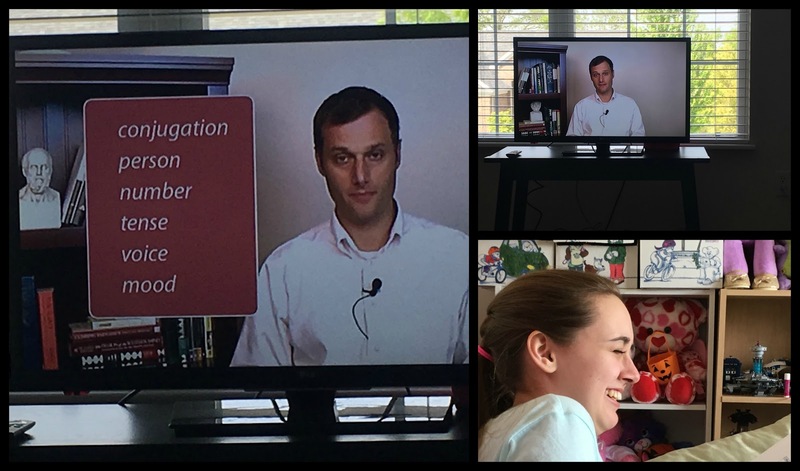 The DVD Latin lesson has become a favorite time during our homeschool day. 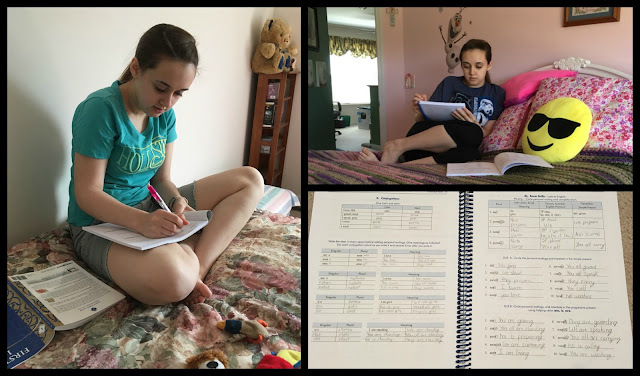 Amber had been asking to refresh her Latin all school year, but she was equally interested in learning Greek which we started second semester this year with First Form Greek, also from Memoria Press. Still, it was hard to pass up the chance to let her work on Latin again. I feared this would be too much foreign language and she would have difficulties studying the two languages at the same time. However, the languages are complementary and the programs structured so similarly that she had no problems at all. We used the suggestions from the Teacher Manual to structure our lessons. On the first day of each new lesson we watched the DVD lesson and then she completed the associated workbook portion. Each of the following 4 days we reviewed vocabulary and the grammar for the lesson before turning her loose on the workbook pages. Instead of using the lesson quizzes as true quizzes, we opted to use them as review sheets on the last day of each lesson. Most lessons Amber was able to complete the quiz sheets without referencing her Student Text, but knowing it wasn't a formal quiz kept her from triggering test anxiety. Daily, Amber used the pronunciation CD that I transferred to her iPad for grammar and vocabulary review. She used the flashcards at that same time to provide her with both auditory and visual input. We did find it easier to put flashcards on a series of rings by punching a hole in each card. We have the cards divided by type: grammar, saying, vocabulary. Since the cards have the lesson number marked on each, Amber can easily identify which cards go with her current lesson and flip to those on the ring. Having been familiar with the structure of the curriculum from our use of First Form Greek, we expected to start up quickly with these lessons and that is just what we did. Still, the set is very well organized and easy to follow for those who have never used any of the First Form language curriculum sets. One note I would make, I would love to see specific daily lesson outlines in the Teacher Manual instead of a sample for a single week in the teaching guidelines. Still, it is easy enough to plan out the daily lessons.